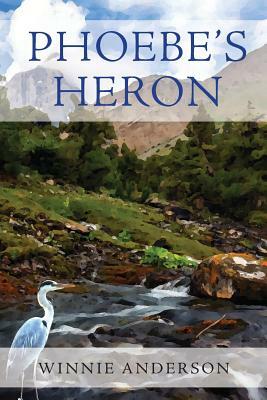 PHOEBE'S HERON, the story of 12-year-old Phoebe Greer, is set in Colorado in 1900. Her first-person narrative begins when Phoebe, her family, and Nurse Daisy, who believes the sun is stronger than any buckshot-colored cloud filled with a needle-hard rain, arrive at their new cliff-top cabin in the foothills of the Rockies. They have moved from Denver in the hope that the fresh air will heal Phoebe's mother's tuberculosis. While Phoebe wants nothing more than for her mother to get well, she misses city life in Denver and her best friend Lisbeth, whose parents own Denver's finest millinery store, where the two girls have spent hours in front of the looking-glass parading with fancy feathered hats on their heads. Phoebe loves to draw. Her father gives her a sketchbook, and she soon meets Jed, a local boy. However, young Jed is a plume hunter, a commercial hunter of birds. He desperately wants to find a great blue heron, whose feathers were in great demand for women's hats. Gradually, the two youngsters become friends. Jed shows Phoebe the delights of the natural world in the Colorado Rockies, and their friendship deepens. On her own one day, Phoebe sees a magnificent great blue heron in the creek, which she sketches in her book. But she does not tell Jed about seeing this bird. Then, Phoebe's mother grows worse, and soon, all will change. This is a lovely, lyrical story about discovery and friendship, and ultimately the courage to take a stand for something greater than oneself.